The outbreak of meningococcal meningitis is a severe public health concern and while effective and affordable treatment options are available in the global market, the disease has been found to induce a high rate of mortality and create long-term neurological defects in infants and young children. 50% of bacterial meningitis cases are found in children below five years of age. The next age group susceptible to the disease is the 15 – 19 years category. Considering the predominant adverse impact of meningococcal meningitis on the young population, top companies like GlaxoSmithKline are working on expanding their product line – including the addition of new formulations – to cater to this demographic. Growing incidence of meningococcal meningitis among young children and adolescents has prompted the inclusion of meningococcal vaccines in national immunisation programmes by the governments of various countries. Demand for meningococcal vaccines for infants surpasses other age groups. Very recently, a study evaluating the safety and efficacy of a new meningococcal vaccine in adolescents and children indicated a satisfactory short-term safety profile with enhanced levels of immunogenicity. It was also observed that individuals who were administered this vaccine developed immunity levels 9-13 times more than those individuals who were administered regular meningococcal vaccines. With the outbreak of meningitis threatening the lives of countless young people all over the world, manufacturers are introducing newer molecule formulations and pipeline products in the global market. This is boosting the growth in demand for the various meningococcal vaccines currently being administered across hospitals, clinics, and other global medical facilities. This awareness gap is the main factor responsible for low demand for meningococcal vaccines and this is expected to have a negative impact on revenue growth of the global meningococcal vaccines market. There is a need to initiate community awareness of the disease and the importance of administering prescribed vaccines so as to curb the proliferation of meningococcal meningitis at the global level. This activity can be initiated by government and healthcare organisations in collaboration with hospitals and clinics to educate parents and create the necessary awareness to encourage the adoption of meningococcal vaccines. This Future Market Insights (FMI) report examines the global meningococcal vaccines market for the period 2013–2028. The primary objective of the report is to offer insights into market opportunity for meningitis vaccines and pipeline developments in the meningitis vaccines market. 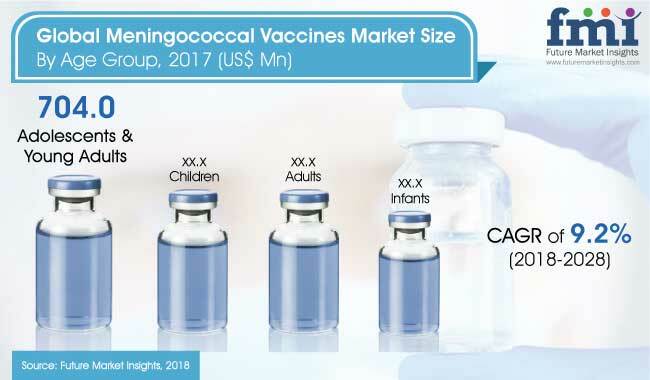 The global meningitis vaccines market has witnessed spontaneous changes in the immunisation landscape after the launch of new vaccines and initiation of public-private alliances to widen immunisation coverage. Meningococcal disease is prevalent in infants and young children. According to Centre for Disease Control and Prevention (CDC), over half of the bacterial meningitis cases occur in children less than five years of age. Approximately 10%-20% of these patients suffer from the severe consequences of meningitis including permanent damage and disability. The report analyses the global meningococcal vaccines market in terms of value (US$ Mn). The report begins with the market definition and explains the different types and causes of meningitis, highlighting bacterial meningitis. This section also explains the prevalence of different serogroups of N. meningitides across key regions. The journey of vaccine manufacturing explains the complex chain involving different nodes in the market and highlights how vaccines reach the market. The market viewpoint section includes FMI’s analysis on key trends, drivers, opportunities, trends and macro factors influencing the global market. Opportunity analysis provided in the section better equips clients with crystal clear decision making insights. Pipeline analysis provided in the subsequent section helps clients identify future competitors in the global market. To arrive at the market size, we have used our in-house epidemiology data-based model to estimate the meningococcal vaccines market size. We have adopted the bottom-up approach to forecast the meningococcal vaccines market. Weighted average selling price has been considered to estimate the market size of various product types mentioned in the scope of the study. The country price is captured with the local currency. The local currency figures are then converted to USD to offer forecasts in a consistent currency standard. Furthermore, we have also considered the latest annual exchange rate to reflect the impact of the most recent economic conditions of each assessed country. The forecast presented in the report provides total revenue of currently approved meningococcal vaccine products over 2018–2028. In addition, we have taken into consideration the year-on-year growth to understand the predictability of the market and to identify the right growth opportunities in the global market. In the next section of the report, a ‘Competitive Landscape’ is included to provide report audiences with a dashboard view of the key differentiators among the competitor firms. Market structure analysis provides tier wise breakdown of total market revenue. The section also provides company share analysis and brand share analysis for key market players. This section is primarily designed to provide clients with an objective and detailed comparative assessment of product offerings and strategies of key providers specific to the various market segments. Detailed profiles of players operating in global meningitis vaccines market are also provided in the report, which highlight company description, overview, product/segment overview, SWOT analysis, financial information, key developments related to the market and a strategic overview. Another key feature of this report is the analysis of key segments in terms of absolute dollar opportunity. This is traditionally overlooked while forecasting the market. However, absolute dollar opportunity is critical for assessing the level of opportunity that a provider can look to achieve, as well as to identify potential resources from a sales and delivery perspective. To understand key growth segments, Future Market Insights provides the ‘Attractiveness Index’ analysis to help clients identify real market opportunities. 14.4.4. Serum Institute of India Ltd.